Believe it or not, this wedding reception was done at the Inn at St. John’s in Plymouth Michigan. I must say this wedding was not your traditional time line. Andrew and Jessica had a band play along side one of our DJs, and besides the photo booth, the couple also decide to go with lighting design. I must say it turned out amazing, you can do so much with rooms at this venue. The guests had a blast in our photo booth! And their dance floor was packed the entire night (hence the pile of clothes on the dance floor). I think the photo above pretty much explains the caption for this post. 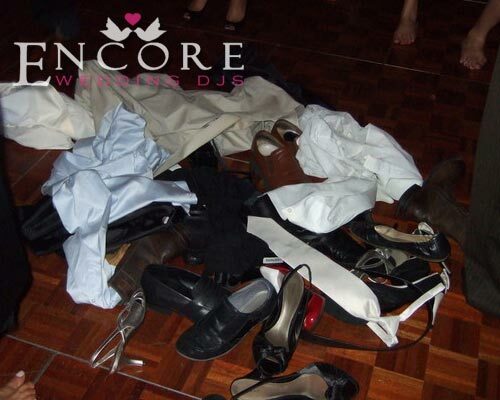 I feel pretty special to have this happens at one of our events… seriously, how many DJ companies in Michigan can say that they’ve had dozens of guests take their clothes off at a single wedding?! We must be pretty friggin’ awesome! Feel free to comment below to let us know your thoughts!